I must confess that I’m not a big fan of the the cosmic side of Marvel Comics’ universe. No disrespect intended to Jim Starlin and everyone who enjoys his grandiose space operas but it just isn’t my cup of nutrimatically replicated dried leaves infused with boiling water. And Infinity Wars is a prime example of why that is so. First of all, if you haven’t been reading the many Infinity series that Marvel Comics has been publishing this year to build off of the hype of Avengers: Infinity War, you may find yourself largely lost. 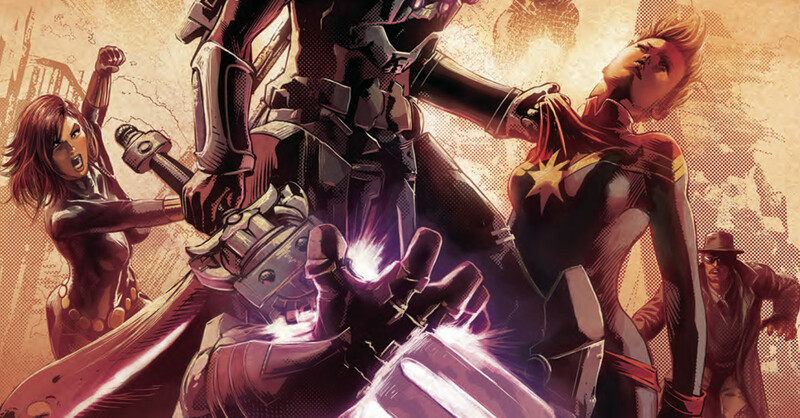 Despite being largely promoted as the perfect entry point into the ongoing saga of The Infinity Stones, there’s a lot of backstory to unpack and a lot of characters who will be totally unknown to casual readers, much less those seeking an entry point into the comics having only seen the movies. 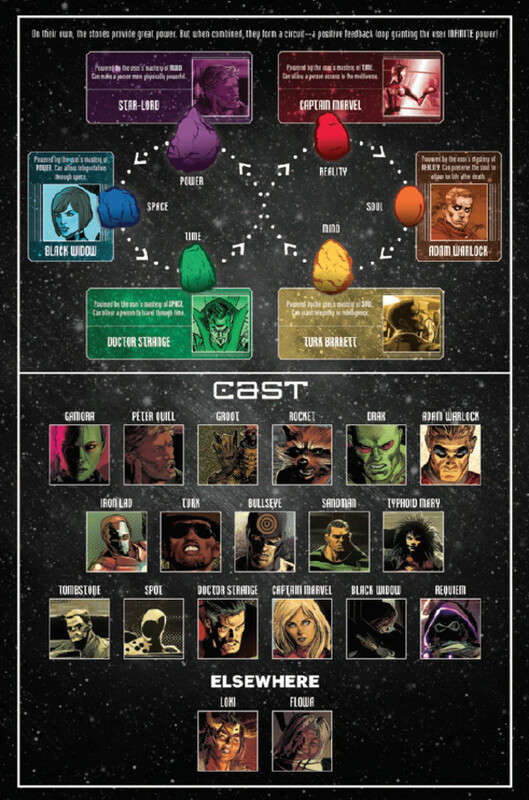 The only concession made to new readers is a cast list and chart showing who currently holds the six Infinity Stones. Even this guide offers more questions than it answers. While fans of Marvel’s Netflix series will know who Turk Barrett is (i.e. the unluckiest crook in New York), most of his crew is made up of villains who haven’t appeared in the movies or TV shows, such as The Spot and Tombstone. Even this amounts to little, as they’re mostly background fodder for when the inevitable fighting begins. Ignoring that, there’s some drastic changes from the movies that may confuse new readers. As the issue opens, The Guardians of the Galaxy have broken up and their membership has largely separated. Also, Groot is either now speaking with an extensive vocabulary or the comic is just automatically translating everything he says. It isn’t really clear and that’s the biggest problem with this book as an entry-point — there’s too many differences from the movies to be comfortable to newbies and too many things it is assumed that the reader already knows. Ironically, those who have been keeping up with the on-going Infinity saga of the past year are likely to find this book largely repetitive. Until the very end, there’s no real new information introduced. Most of the comic’s story is concerned with running down who currently holds the Infinity Stones and their gathering at Doctor Strange’s request to discuss spreading the stones out so there aren’t as many on Earth if Thanos comes looking for them. The book’s one saving grace is its artwork, which is uniformly fantastic. 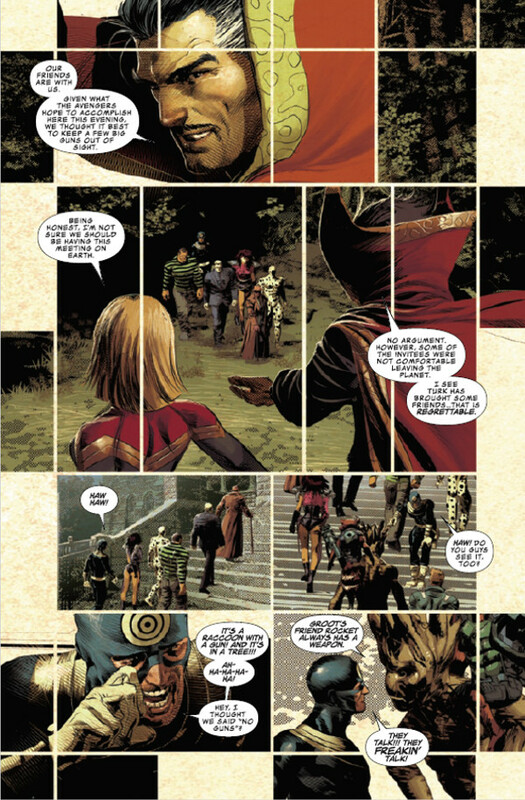 Mike Deodato Jr. and Frank Martin’s work here invites comparison to Alex Ross’ art in Kingdom Come, being full of detail and rendering everything in an epic scope. Unfortunately, while the story flows well between panels, most readers may find themselves having to stop and Google certain character names or look up a synopsis of an earlier storyline. 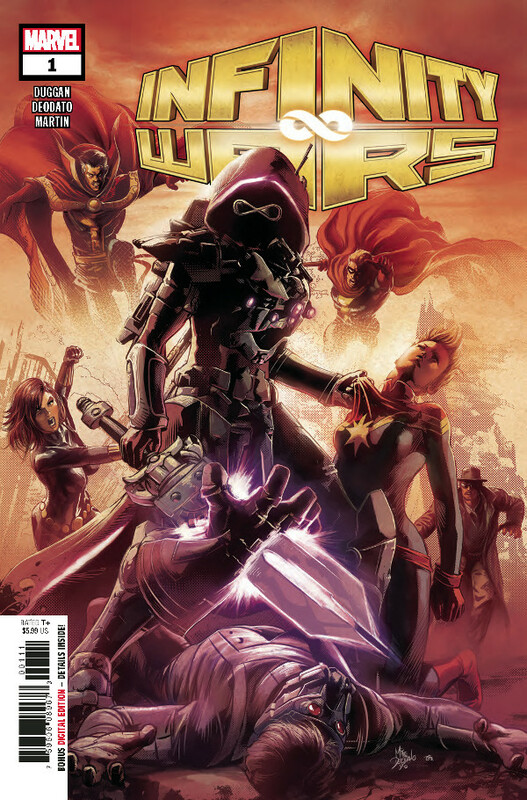 Is Infinity Wars #1 worth picking up? Certainly, if you enjoy the cosmic side of Marvel Comics or are highly invested in learning how The Infinity Stones will be forever changed. Casual readers and newcomers will have a harder time without investing some time in studying Recent Marvel History 101. If you don’t mind a little homework, this is a rewarding book with fantastic artwork, but it’s hardly the marvelous entry point to the Marvel Universe it’s been promoted as. 5/10 Infinity Wars #1 releases on August 1, 2018!